Solar photovoltaics (PVs) are arrays of cells containing a material that converts solar radiation into direct current electricity. Materials presently used for photovoltaics include amorphous silicon, polycrystalline silicon, microcrystalline silicon, cadmium telluride, and copper indium selenide/sulfide. Due to the growing demand for renewable energy sources, the manufacture of solar cells and photovoltaic arrays has advanced dramatically in recent years. or built into the roof or walls of a building, known as Building Integrated Photovoltaics or BIPV for short. Solar PV power stations today have capacities ranging from 10-60 MW although proposed solar PV power stations will have a capacity of 150 MW or more. Driven by advances in technology and increases in manufacturing scale and sophistication, the cost of photovoltaics has declined steadily since the first solar cells were manufactured. Net metering and financial incentives, such as preferential feed-in tariff for solar-generated electricity, have supported solar PV installations in many countries. Average solar irradiance, watts per square metre. Note that this is for a horizontal surface, whereas solar panels are normally mounted at an angle and receive more energy per unit area. The small black dots show the area of solar panels needed to generate all of the world's energy using 8% efficient photovoltaics. Cells require protection from the environment and are usually packaged tightly behind a glass sheet. When more power is required than a single cell can deliver, cells are electrically connected together to form photovoltaic modules, or solar panels. A single module is enough to power an emergency telephone, but for a house or a power plant the modules must be arranged in multiples as arrays. Although the selling price of modules is still too high to compete with grid electricity in most places, significant financial incentives in Japan and then Germany, Italy and France triggered a huge growth in demand, followed quickly by production. In 2008, Spain installed 45% of all photovoltaics, but a change in law limiting the feed-in tariff is expected to cause a precipitous drop in the rate of new installations there, from an extra 2500 MW in 2008 to an expected additional 375 MW in 2009. Germany was the fastest growing major PV market in the world from 2006 to 2007. By 2008, 5.337 GWp of PV was installed, or 35% of the world total. The German PV industry generates over 10,000 jobs in production, distribution and installation. By the end of 2006, nearly 88% of all solar PV installations in the EU were in grid-tied applications in Germany.Photovoltaic power capacity is measured as maximum power output under standardized test conditions (STC) in "Wp" (Watts peak). The actual power output at a particular point in time may be less than or greater than this standardized, or "rated," value, depending on geographical location, time of day, weather conditions, and other factors. Solar photovoltaic array capacity factors are typically under 25%, which is lower than many other industrial sources of electricity. Therefore the 2008 installed base peak output would have provided an average output of 3.04 GW (assuming 20% × 15,200 MWp). This represented 0.15 percent of global demand at the time. The EPIA/Greenpeace Advanced Scenario shows that by the year 2030, PV systems could be generating approximately 1,864 GW of electricity around the world. This means that, assuming a serious commitment is made to energy efficiency, enough solar power would be produced globally in twenty-five years’ time to satisfy the electricity needs of almost 14% of the world’s population. Map of solar electricity potential in Europe. Germany is the current leader in solar production. Newer alternatives to standard crystalline silicon modules include casting wafers instead of sawing, thin film (CdTe CIGS, amorphous Si, microcrystalline Si), concentrator modules, 'Sliver' cells, and continuous printing processes. Due to economies of scale solar panels get less costly as people use and buy more — as manufacturers increase production to meet demand, the cost and price is expected to drop in the years to come. By early 2006, the average cost per installed watt for a residential sized system was about USD 7.50 to USD 9.50, including panels, inverters, mounts, and electrical items. In 2006 investors began offering free solar panel installation in return for a 25 year contract, or Power Purchase Agreement, to purchase electricity at a fixed price, normally set at or below current electric rates. It is expected that by 2009 over 90% of commercial photovoltaics installed in the United States will be installed using a power purchase agreement. An innovative financing arrangement is being tested in Berkeley, California , which adds an amount to the property assessment to allow the city to pay for the installed panels up front, which the homeowner pays for over a 20 year period at a rate equal to the annual electric bill savings, thus allowing free installation for the homeowner at no cost to the city. As of October 2009, the largest photovoltaic power plant in North America is the 25 MW DeSoto Next Generation Solar Energy Center in Florida. The plant consists of over 90,000 solar panels. Topaz Solar Farm is a proposed 550 MW solar photovoltaic power plant which is to be built northwest of California Valley in the US at a cost of over $1 billion.Built on of ranchland, the project would utilize thin-film PV panels designed and manufactured by OptiSolar in Hayward and Sacramento . The project would deliver approximately 1,100 gigawatt-hours (GW·h) annually of renewable energy. The project is expected to begin construction in 2010, begin power delivery in 2011, and be fully operational by 2013. High Plains Ranch is a proposed 250 MW solar photovoltaic power plant which is to be built by SunPower in the Carrizo Plain , northwest of California Valley . Photovoltaic solar panels on a house roof. Building-integrated photovoltaics (BIPV) are increasingly incorporated into new domestic and industrial buildings as a principal or ancillary source of electrical power, and are one of the fastest growing segments of the photovoltaic industry. Typically, an array is incorporated into the roof or walls of a building, and roof tiles with integrated PV cells can now be purchased. Arrays can also be retrofitted into existing buildings; in this case they are usually fitted on top of the existing roof structure. Alternatively, an array can be located separately from the building but connected by cable to supply power for the building. Where a building is at a considerable distance from the public electricity supply (or grid) - in remote or mountainous areas – PV may be the preferred possibility for generating electricity, or PV may be used together with wind, diesel generators and/or hydroelectric power. In such off-grid circumstances batteries are usually used to store the electric power. In locations near the grid, however, feeding the grid using PV panels is more practical, and leads to optimum use of the investment in the photovoltaic system. This requires both regulatory and commercial preparation, including net-metering and feed-in agreements. To provide for possible power failure, some grid tied systems are set up to allow local use disconnected from the grid. Most photovoltaics are grid connected. In the event the grid fails, the local system must not feed the grid to prevent the possible creation of dangerous islanding. The power output of photovoltaic systems for installation in buildings is usually described in kilowatt-peak units (kWp). PV has traditionally been used for auxiliary power in space. PV is rarely used to provide motive power in transport applications, but is being used increasingly to provide auxiliary power in boats and cars. Recent advances in solar race cars, however, have produced cars that with little changes could be used for transportation. Until a decade or so ago, PV was used frequently to power calculators and novelty devices. Improvements in integrated circuits and low power LCD displays make it possible to power such devices for several years between battery changes, making PV use less common. In contrast, solar powered remote fixed devices have seen increasing use recently in locations where significant connection cost makes grid power prohibitively expensive. Such applications include parking meters, emergency telephones, temporary traffic signs, and remote guard posts & signals. Developing countries where many villages are often more than five kilometers away from grid power have begun using photovoltaics. In remote locations in India a rural lighting program has been providing solar powered LED lighting to replace kerosene lamps. The solar powered lamps were sold at about the cost of a few month's supply of kerosene. Cuba is working to provide solar power for areas that are off grid. These are areas where the social costs and benefits offer an excellent case for going solar though the lack of profitability could relegate such endeavors to humanitarian goals. A section of roadway in Idaho is being used to test the possibility of installing solar panels into the road surface, as roads are generally unobstructed to the sun and represent about the percentage of land area needed to replace other energy sources with solar power. Generally, temperatures above room temperature reduce the performance of photovoltaics. For best performance, PV systems aim to maximize the time they face the sun. Solar trackers aim to achieve this by moving PV panels to follow the sun. The increase can be by as much as 20% in winter and by as much as 50% in summer. Static mounted systems can be optimized by analysis of the Sun path. Panels are often set to latitude tilt, an angle equal to the latitude, but performance can be improved by adjusting the angle for summer and winter. US average daily solar energy insolation received by a latitude tilt photovoltaic cell. In photovoltaics, the solar value added chain is the set of steps from sand or raw silicon to the completed solar module and photovoltaic system completion and installation. The PV industry is beginning to adopt levelized cost of energy (LCOE) as the unit of cost. For a 10 MW plant in Phoenix, AZ, the LCOE is estimated at $0.15 to 0.22/kWh in 2005. The table below is a pure mathematical calculation. It illustrates the calculated total cost in US cents per kilowatt-hour of electricity generated by a photovoltaic system as function of the investment cost and the efficiency, assuming some accounting parameters such as cost of capital and depreciation period. The row headings on the left show the total cost, per peak kilowatt (kWp), of a photovoltaic installation. The column headings across the top refer to the annual energy output in kilowatt-hours expected from each installed peak kilowatt. This varies by geographic region because the average insolation depends on the average cloudiness and the thickness of atmosphere traversed by the sunlight. It also depends on the path of the sun relative to the panel and the horizon. Panels can be mounted at an angle based on latitude, or solar tracking can be utilized to access even more perpendicular sunlight, thereby raising the total energy output. The calculated values in the table reflect the total cost in cents per kilowatt-hour produced. They assume a 10% total capital cost (for instance 4% interest rate, 1% operating and maintenance cost, and depreciation of the capital outlay over 20 years). Physicists have claimed that recent technological developments bring the cost of solar energy more in parity with that of fossil fuels. In 2007, David Faiman, the director of the Ben-Gurion National Solar Energy Center of Israel, announced that the Center had entered into a project with Zenith Solar to create a home solar energy system that uses a 10 square meter reflector dish. In testing, the concentrated solar technology proved to be up to five times more cost effective than standard flat photovoltaic silicon panels, which would make it almost the same cost as oil and natural gas. A prototype ready for commercialization achieved a concentration of solar energy that was more than 1,000 times greater than standard flat panels. Grid parity, the point at which photovoltaic electricity is equal to or cheaper than grid power, is achieved first in areas with abundant sun and high costs for electricity such as in California and Japan . Grid parity has been reached in Hawaii and other islands that otherwise use fossil fuel (diesel fuel) to produce electricity, and most of the US is expected to reach grid parity by 2015. General Electric's Chief Engineer predicts grid parity without subsidies in sunny parts of the United States by around 2015. Other companies predict an earlier date: the cost of solar power will be below grid parity for more than half of residential customers and 10% of commercial customers in the OECD, as long as grid electricity prices do not decrease through 2010.
unexpected risk for traditional power generation companies, grid operators and wind turbine manufacturers. Abengoa Solar has announced the award of two R&D projects in the field of Concentrating Solar Power (CSP) by the US Department of Energy that total over $14 million. The goal of the DOE R&D program, working in collaboration with partners such as Abengoa Solar, is to develop CSP technologies that are competitive with conventional energy sources (grid parity) by 2015. Concentrating photovoltaics (CPV) could reach grid parity in 2011. In Sept 2009, Maharishi Solar Technology announces tie-up with Abengoa Solar. Due to the growing demand for photovoltaic electricity, more companies enter into this market and lower cost of the photovoltaic electricity would be expected. Anwell Technologies Limited recently announced that its multi-substrate-multi-chamber PECVD targets to lower the cost to USD0.5 per watt in the future. Net metering is particularly important because it can be done with no changes to standard electricity meters, which accurately measure power in both directions and automatically report the difference, and because it allows homeowners and businesses to generate electricity at a different time from consumption, effectively using the grid as a giant storage battery. As more photovoltaics are used ultimately additional transmission and storage will need to be provided, normally in the form of pumped hydro-storage. Normally with net metering, deficits are billed each month while surpluses are rolled over to the following month and paid annually. With investment subsidies, the financial burden falls upon the taxpayer, while with feed-in tariffs the extra cost is distributed across the utilities' customer bases. While the investment subsidy may be simpler to administer, the main argument in favour of feed-in tariffs is the encouragement of quality. Investment subsidies are paid out as a function of the nameplate capacity of the installed system and are independent of its actual power yield over time, thus rewarding the overstatement of power and tolerating poor durability and maintenance. Some electric companies offer rebates to their customers, such as Austin Energy in Texas , which offers $4.50/watt installed up to $13,500. Where price setting by supply and demand is preferred, RECs can be used. In this mechanism, a renewable energy production or consumption target is set, and the consumer or producer is obliged to purchase renewable energy from whoever provides it the most competitively. The producer is paid via an REC. In principle this system delivers the cheapest renewable energy, since the lowest bidder will win. However, uncertainties about the future value of energy produced are a brake on investment in capacity, and the higher risk increases the cost of capital borrowed. In 2004, the German government introduced the first large-scale feed-in tariff system, under a law known as the 'EEG' (Erneuerbare Energien Gesetz) which resulted in explosive growth of PV installations in Germany. At the outset the FIT was over 3x the retail price or 8x the industrial price. The principle behind the German system is a 20 year flat rate contract. The value of new contracts is programmed to decrease each year, in order to encourage the industry to pass on lower costs to the end users. The programme has been more successful than expected with over 1GW installed in 2006, and political pressure is mounting to decrease the tariff to lessen the future burden on consumers. Subsequently Spain, Italy, Greece (who enjoyed an early success with domestic solar-thermal installations for hot water needs) and France introduced feed-in tariffs. None have replicated the programmed decrease of FIT in new contracts though, making the German incentive relatively less and less attractive compared to other countries. The French and Greek FIT offer a high premium (EUR 0.55/kWh) for building integrated systems. California, Greece, France and Italy have 30-50% more insolation than Germany making them financially more attractive. The Greek domestic "solar roof" programme (adopted in June 2009 for installations up to 10 kW) has internal rates of return of 10-15% at current commercial installation costs, which, furthermore, is tax free. At the end of 2006, the Ontario Power Authority (OPA, Canada) began its Standard Offer Program (SOP), the first in North America for small renewable projects (10MW or less). This guarantees a fixed price of $0.42 CDN per kWh over a period of twenty years. Unlike net metering, all the electricity produced is sold to the OPA at the SOP rate. The generator then purchases any needed electricity at the current prevailing rate (e.g., $0.055 per kWh). The difference should cover all the costs of installation and operation over the life of the contract. On October 1, 2009, OPA issued a Feed in Tarrif (FIT) program, increasing this fixed price to $0.822 per kWh.. The price per kilowatt hour or per peak kilowatt of the FIT or investment subsidies is only one of three factors that stimulate the installation of PV. The other two factors are insolation (the more sunshine, the less capital is needed for a given power output) and administrative ease of obtaining permits and contracts. Unfortunately the complexity of approvals in California, Spain and Italy has prevented comparable growth to Germany even though the return on investment is better. In some countries, additional incentives are offered for BIPV compared to stand alone PV. There is an International Conference on Solar Photovoltaic Investments organized by EPIA. Unlike fossil fuel based technologies, solar power does not lead to any harmful emissions during operation, but the production of the panels leads to some amount of pollution. This is often referred to as the energy input to output ratio. In some analysis, if the energy input to produce it is higher than the output it produces it can be considered environmentally more harmful than beneficial. Also, placement of photovoltaics affects the environment. If they are located where photosynthesizing plants would normally grow, they simply substitute one potentially renewable resource (biomass) for another. It should be noted, however, that the biomass cycle converts solar radiation energy to chemical energy ( with significantly less efficiency than photovoltaic cells alone). And if they are placed on the sides of buildings (such as in Manchester ) or fences, or rooftops (as long as plants would not normally be placed there), or in the desert they are purely additive to the renewable power base. Life cycle greenhouse gas emissions are now in the range of 25-32 g/kWh and this could decrease to 15 g/kWh in the future.For comparison (of weighted averages), a combined cycle gas-fired power plant emits some 400-599 g/kWh, an oil-fired power plant 893 g/kWh, a coal-fired power plant 915-994 g/kWh or with carbon capture and storage some 200 g/kWh, and a geothermal high-temp. power plant 91-122 g/kWh. Only nuclear, wind and geothermal low-temp. are better, emitting 6-25 g/kWh, 11 g/kWh and 0-1 g/kWh on average. Using renewable energy sources in manufacturing and transportation would further drop carbon emissions. BP Solar owns two factories built by Solarex (one in Maryland, the other in Virginia) in which all of the energy used to manufacture solar panels is produced by solar panels. One issue that has often raised concerns is the use of cadmium in cadmium telluride solar cells (CdTe is only used in a few types of PV panels). Cadmium in its metallic form is a toxic substance that has the tendency to accumulate in ecological food chains. The amount of cadmium used in thin-film PV modules is relatively small (5-10 g/m²) and with proper emission control techniques in place the cadmium emissions from module production can be almost zero. Current PV technologies lead to cadmium emissions of 0.3-0.9 microgram/kWh over the whole life-cycle. Most of these emissions actually arise through the use of coal power for the manufacturing of the modules, and coal and lignite combustion leads to much higher emissions of cadmium. Life-cycle cadmium emissions from coal is 3.1 microgram/kWh, lignite 6.2, and natural gas 0.2 microgram/kWh. Note that if electricity produced by photovoltaic panels were used to manufacture the modules instead of electricity from burning coal, cadmium emissions from coal power usage in the manufacturing process could be entirely eliminated. The energy payback time is the time required to produce an amount of energy as great as what was consumed during production. The energy payback time is determined from a life cycle analysis of energy. The energy needed to produce solar panels will be paid back in the first few years of use. "Laser technology for photovoltaics manufacturing.(GERMANY)." Advanced Manufacturing Technology 30.4 (April 15, 2009): 5(1). Expanded Academic ASAP. Gale. BENTLEY UPPER SCHOOL LIBRARY (BAISL). 6 Oct. 2009/find.galegroup.com/gtx/start.do?prodId=EAIM>. Another key indicator of environmental performance, tightly related to the energy payback time, is the ratio of electricity generated divided by the energy required to build and maintain the equipment. This ratio is called the energy returned on energy invested (EROEI). Of course, little is gained if it takes as much energy to produce the modules as they produce in their lifetimes. This should not be confused with the economic return on investment, which varies according to local energy prices, subsidies available and metering techniques. Life-cycle analyses show that the energy intensity of typical solar photovoltaic technologies is rapidly evolving. In 2000 the energy payback time was estimated as 8 to 11 years, but more recent studies suggest that technological progress has reduced this to 1.5 to 3.5 years for crystalline silicon PV systems. Thin film technologies now have energy pay-back times in the range of 1-1.5 years (S.Europe). With lifetimes of such systems of at least 30 years , the EROEI is in the range of 10 to 30.They thus generate enough energy over their lifetimes to reproduce themselves many times (6-31 reproductions, the EROEI is a bit lower) depending on what type of material, balance of system (or BOS), and the geographic location of the system. The 89 petawatts of sunlight reaching the Earth's surface is plentiful - almost 6,000 times more than the 15 terawatt of average electrical power consumed by humans. Additionally, solar electric generation has the highest power density (global mean of 170 W/m²) among renewable energies. Solar power is pollution-free during use. Production end-wastes and emissions are manageable using existing pollution controls. End-of-use recycling technologies are under development. Solar electric generation is economically superior where grid connection or fuel transport is difficult, costly or impossible. Long-standing examples include satellites, island communities, remote locations and ocean vessels. When grid-connected, solar electric generation replaces some or all of the highest-cost electricity used during times of peak demand (in most climatic regions). This can reduce grid loading, and can eliminate the need for local battery power to provide for use in times of darkness. These features are enabled by net metering. Time-of-use net metering can be highly favorable, but requires newer electronic metering, which may still be impractical for some users. Compared to fossil and nuclear energy sources, very little research money has been invested in the development of solar cells, so there is considerable room for improvement. Nevertheless, experimental high efficiency solar cells already have efficiencies of over 40% and efficiencies are rapidly rising while mass-production costs are rapidly falling. Photovoltaics are costly to install. While the modules are often warranted for upwards of 20 years, an investment in a home-mounted system is mostly lost if you move. The city of Berkeley has come up with an innovative financing method to remove this limitation, by adding a tax assessment that is transferred with the home to pay for the solar panels. Nine U.S. states have duplicated this solution. Solar electricity is seen to be expensive. Once a PV system is installed it will produce electricity for no further cost until the inverter needs replacing. Current utility rates have increased every year for the past 20 years and with the increasing pressure on carbon reduction the rate will increase more aggressively . This increase will (in the long run) easily offset the increased cost at installation but the timetable for payback is too long for most. Solar electricity is not available at night and is less available in cloudy weather conditions from conventional silicon based-technologies. Therefore, a storage or complementary power system is required. 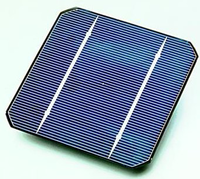 However, the use of germanium in amorphous silicon-germanium thin-film solar cells provides residual power generating capacity at night due to background infrared radiation. Apart from their own efficiency figures, PV systems work within the limited power density of their location's insolation. Average daily insolation (output of a flat plate collector at latitude tilt) in the contiguous US is 3-7 kilowatt·h/m² and on average lower in Europe. Solar cells produce DC which must be converted to AC (using a grid tie inverter) when used in current existing distribution grids. This incurs an energy loss of 4-12%. REN21 (2009). Renewables Global Status Report: 2009 Update p. 12. Mark Z. Jacobson (2009). Review of Solutions to Global Warming, Air Pollution, and Energy Security p. 4. Richard M. Swanson. Photovoltaics Power Up, Science, Vol. 324, 15 May 2009, p. 891. UtiliPoint International, Inc. 'Issue alert - What is a megawatt? Building Integrated Photovoltaics, Wisconsin Public Service Corporation, accessed: 2007-03-23. Zenith Solar’s Light of a Thousand Suns, Green Prophet, December 17, 2007. At the Zenith of Solar Energy, Neal Sandler,BusinessWeek, March 26, 2008. [ http://www.cnbc.com/id/32551044/site/14081545 China Racing Ahead of America in the Drive to Go Solar]. Approved — Feed-in tariff in Israel. Alsema, E.A. ; Wild - Scholten, M.J. de; Fthenakis, V.M. Environmental impacts of PV electricity generation - a critical comparison of energy supply options ECN, September 2006; 7p. Presented at the 21st European Photovoltaic Solar Energy Conference and Exhibition, Dresden, Germany, 4-8 September 2006. Andrew Blakers and Klaus Weber, “The Energy Intensity of Photovoltaic Systems”, Centre for Sustainable Energy Systems, Australian National University, 2000. Joshua Pearce and Andrew Lau, “Net Energy Analysis For Sustainable Energy Production From Silicon Based Solar Cells”, Proceedings of American Society of Mechanical Engineers Solar 2002: Sunrise on the Reliable Energy Economy, editor R. Campbell-Howe, 2002. Insolation figures of 3-7 kilowatt·h/m² for the contiguous US are from the map colors which slightly contradict the table above which claims 900 to 2100 yearly insolation, that makes 2.46 to 5.7 daily. Also, second cite does not claim 3 or 7, third cite also makes no mention. There is also a need to clarify what kind of insolation is meant, presumably vertical. NREL Map of Flat Plate Collector at Latitude Tilt Yearly Average Solar Radiation See also. K. J. Bachmann et al., "Polycrystalline Thin-Film InP-CdS Solar Cells", Appl. Phys. Letters, vol. 29, No. 2, July 1976, pp. 121–123. There are many research institutions and departments at universities around the world who are active in photovoltaics research. Countries which are particularly active include Germany , Spain , Japan , Australia, China , and the US . DSIRE Listing of US state, local, utility, and federal incentives for renewable energy and energy efficiency. Conference: The Thin-film Future, shortcut to grid parity?